The Marketplace at Ai-Kon 2017 is expected to be better than ever, with old favorites and new vendors will be ready with all sorts of otaku goods for you, including ANIME, MANGA, COSPLAY ITEMS and SNACKS! The best news? Bags are now allowed in the Marketplace! 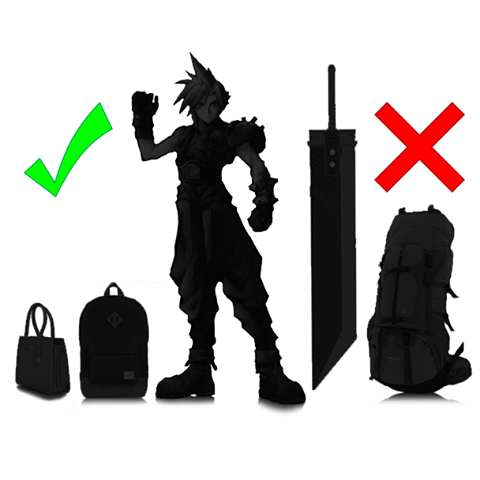 Large, obstructive bags and items (including OVERSIZED cosplay props), however, are not. If we feel that any item you are bringing into the Marketplace would be a problem to others in the room, you will be asked to leave it in Bag Check. We hope our handy image will help demonstrate what is and isn’t allowed. For an updated vendor listing please visit our Vendor and Artist pages. For our full Cosplay policy please visit our Cosplay page. And for the most up to date info during Ai-Kon, please see our new App! Thank you for an awesome Kick Off!